BTN has to report bad times. The once mighty QE2 is languishing in a remote part of the Port of Dubai, rust appearing fast and the facilities deteriorating. No doubt Cunard took precautions when it disposed of its former Queen of the Sea, but sadly the historical record of keeping old ships flourishing afloat is not very good. What enthusiastic new owners do not appreciate is the sheer cost. QE2’s distinguished predecessor, the Queen Elizabeth mysteriously caught fire in Hong Kong just at a point when questions were being asked of its future, and its sister ship RMS Queen Mary, has had a speckled history since finishing up at Long Beach, south of Los Angeles, in December 1967. Queen Mary now seems to be out of the doldrums and is sailing onwards as a 5-star hotel and visitor attraction. Not dissimilar to the fortune of Queen Mary is ss Rotterdam, nowadays also a hotel, and moored opposite the original Holland America Rotterdam cruise terminal, currently the Hotel New York. Just like its former Cunard counterpart day visitors are welcome and it is full of nostalgia from the line’s glorious past. Retired in 2000 it was not until 2010 that she finally opened to the public. The cost of keeping old ships respectable is enormous and not always understood. Britain’s largest Royal Navy vessel open to the public is a light cruiser, HMS Belfast. Only sponsorship has kept it viable. 45 battleships were constructed from Dreadnought in 1904 until Vanguard in 1944, and not one remains, nor an aircraft carrier. The US named their ships after States and amongst others the giant Missouri, New Jersey and Wisconsin still exist, at enormous expense. And there lies the problem for both passenger and navy ships. The sheer cost. Let us hope some kind of remedy can be found for QE2’s problems. QE’s resurrection is our wish for 2015. Britain’s annual National Ferry Fortnight will take place 2-15 March 2015. Now in its seventh year, the campaign has been growing steadily since launching in 2009. Supported by the 12 members of Discover Ferries, the consumer-facing industry body for the ferry industry – the two-week showcase was created to heighten consumer and media awareness of Britain’s extensive 75-plus ferry routes. National Ferry Fortnight urges ferry operators and passengers alike to enjoy ‘Ferry Freedom’ and encourages consumers and their families to experience the ease, value and flexibility of ferry travel – as well as the freedom offered by this way of transport. Around 40m passengers would have travelled by ferry in 2014 and ferry companies have invested millions in modern, versatile fleets and upgraded services. With spas, executive lounges and fine dining restaurants on many ships, the ferry cruise should be part of the holiday. For longer transits two-berth cabins are available. Balconies next? If you are the type to plan ahead and fancy cruising for next Christmas and the New Year Business Travel News can highly recommend Oceania Cruises (in fact any time of the year). My wife and I have recently sampled Oceania Rivera for a few days in the Eastern Mediterranean and it can only be described as top class. The weather was pretty good as well. Founded in 2002 Oceania is a 21st century cruise line and is based in Miami. 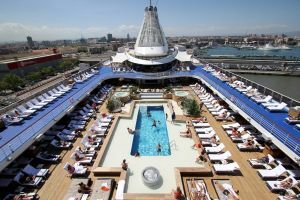 It currently operates two medium size 5-star ships Marina and Riviera (66,000 tons and 1,250 passengers – Berlitz 1679) and three more boutique offerings Insignia, Nautica and Regatta (30,000 tons and 684 passengers – Berlitz 1541). A fourth small ship is planned for 2016 but Oceania has recently been acquired by Norwegian Cruise Lines together with sister company Regent Seven Seas, equally up-market. Things can change. Our ship, Riviera, was of the highest quality and can be best described as a ‘foodies’ cruise ship, the four gourmet alternative restaurants part of the cruise package. For the most part no extras are charged as far as eating is concerned. 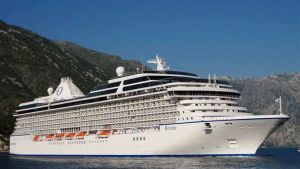 This is a review of the ship and the actual cruise will feature ON TOUR next year – except for Ephesus, one of the world’s great archaeological sites of the Greek/Roman era. Do have a look at the piece in this issue as part of your Christmas reading. Our Oceania Riviera cruise started at the port of Athens. Piraeus is the water gateway to Athens. It does not sound glamourous. It is the Mediterranean’s busiest port in terms of passenger numbers with ferries rushing in an out all the time to the numerous Greek islands. Worldwide it is astonishingly number three. Our air timings were such that it was risky taking a flight on the departure day and a night stop was decided using Ryanair and its new ‘be nice to the passenger’ operation. In fact nothing has changed, you still have to climb up the steps of the aircraft at Stansted. There is nowhere to store things once seated, the cabin service is OK, but a nice new aircraft leaving announcement is heard. It could not have cost Mr O’Leary very much. If you are on a trip abroad over seven days make sure you can check-in somewhere. Doing so at the airport is £70. One item for the hold was £30 outbound and €25 (£20) inbound! Trying to take the insurance charge off was not easy. At Rome Ciampino on the way back we discovered another Ryanair arrangement! In order to meet the 25-minute turnaround ‘clients’ are loaded into the buses well before the aircraft is ready and are then left waiting on the apron for the crew to call ready. Standing room only of course for 10 minutes and fortunately it was not too hot. Two coaches, 189 people. That is a lot of people per bus. At Stansted the flight was called equally early and passengers (those daft enough to follow the queue) had to stand in the confined gathering area! Does this speed up the turnaround. I question it. Piraeus turned out to be a real joy and not the port town one expected. The bus from the airport took 40 minutes on a Sunday (one every 20 minutes and well signposted at the airport) and cost just €5. Recommended by others, our hotel, the Phidias Piraeus, met us at the bus stop. It was even better than we had been told. Just 36 exceptionally modern air-conditioned rooms spread over six floors. Wi-fi and an excellent hot breakfast included at a price comparable to UK chain budget properties. In truth 4-star boutique. We dined at the Parmigiani, five minutes along the promenade for silly money. First rate Italian. 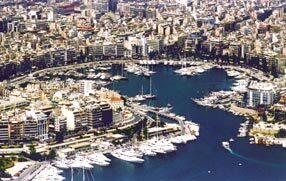 Piraeus was clean, friendly, with the leisure port, Zea Marina, full of very expensive motor yachts. Around a headland the Mikrolimano harbour is smaller but with a similar make-up of pleasure craft and fishing vessels. The Nautical Museum traces Greek ships and shipping since the beginning of time, through the Onassis era, to the latest massive container ship. 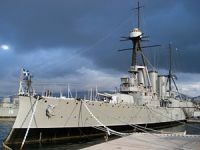 Moored a short taxi ride away is the cruiser Georgios Averof dating from 1910. Greek run, Italian built, British guns, and with German machinery it has somehow survived. Piraeus has an Archaeological Museum and a fine Municipal Theatre. The following morning we were dropped off for Riviera, moored in the massive ferry port, straight into the arms of the baggage handling team and were very quickly on board. There is a saying that first impressions count. With that in mind our arrival on Riviera could not be better. True at 11:00 the stateroom was not ready, but that was to be expected. In every other respect the welcome mat was out and it was time to explore the ship and enjoy the buffet dining. I use the word dining. It is the best description of the Terrace Café. It is certainly not a café in the accepted connotation. High quality varied eating. The best informal serve yourself at sea except there was no touching the food. Staff were on hand to delicately plate one’s requirement and more staff were quickly to one’s side offering to take the nutrition to a table. It had very rapidly become apparent that the staff to passenger ratio was more than adequate. On this trip 700+ crew looked after 1,100 customers. They represented 50 nations. Cruise ships continue to prove that nationalities can work together for the common good. The Terrace Café is really a restaurant where you view the offerings rather than choose from a menu. It is open in the evenings too and sitting out over the stern is really pleasant. The décor of Riviera is outstanding. Rich woods, marble and granite combining with custom crafted furnishings. Everything is very much understated. Couple that with country club casual ambience and you have a truly outstanding cruise ship. Children are not encouraged and whilst there is plenty of music and entertainment the mood of the ship is refinement and elegance. Our fellow holidaymakers were the vast majority from North America, some Brits, inevitably Ozzies, and a few Continentals. A Japanese contingent had their own interpreter. By one o’clock all the cabins were ready and off we trotted to our Veranda Stateroom with its two TVs and separate bath and shower. It was spacious with a full size balcony and a fridge with soft drinks. We benefited from free pressing and shoe shine services and the wi-fi worked OK, good enough to produce Business Travel News. The in-room menu is extensive and available 24 hours, with the full dining room bill of fare available at restaurant opening times. Our stateroom grade has its own lounge with concierge service and the daily newspapers printed out. Nibbles too if you wanted. When it comes to what to wear think casual-but-elegant throughout the ship, both day and night. Swimwear and the like are discouraged at all times from any of the restaurants, while shorts, jeans, T-shirts, trainers and sandals are not allowed in most eateries at dinner. Jackets are not essential at night, but this is a top class ship and people dress accordingly. Men can't go wrong with blazers and slacks in the evening, while women will feel comfortable in elegant casual resort wear. Riviera has on offer everything that one would expect of a vessel of this class including a decent size swimming pool and plenty of nooks and crannies to sunbathe. The Canyon Ranch Spa is of the highest quality and the theatre hosts the in-house orchestra, dancers and singers, and top quality variety acts. During our trip there was a fascinating lecture series – “The Italian Americans”. It seems that they did not all belong to the Mafia! As noted previously Oceania is for ‘foodies’. If you want to be both a diner and a master of the kitchen you can sign up for the Bon Appetit Culinary Centre. Chef Noelle P. Barille blended her love of travel and food for a series of ‘hands on’ lessons. Two guests per station in the purpose-built kitchen and a whole series of culinary classes ranging from French, Turkish, and what was termed “The Italian Family Table”. The main restaurant is called “The Grand Dining Room” and that just about sums it up. It is open from 06:30 until 21:30 in the evenings, for breakfast, and sometimes lunch. The food quality and choice is equal to the speciality restaurants but not so focused. There is lobster, caviar and all sorts of beef cuts available. And you can sojourn as long as you like. If it is a speciality you want, advise the Maitre d’ at the previous meal. They will do their utmost to assist and carry speciality ethnic requirements. You are guaranteed one meal in each of the speciality eateries. Also available is the Privée, available for private parties and a seven-course Connoisseur menu each course paired with a different wine. This 24-seat restaurant levies a fee – it is US$95 plus an 18% gratuity – for seven courses. “Jacques” is Paris at sea. It feels like “Paris at sea” but there is no large bill at the end (except the wine at London West End prices). You can choose from bistro fare like escargot, foie gras, steak frites, cassoulet and Pepin's signature rotisserie meats with a European flair (herb crusted “black foot” roast chicken, garlic marinated veal rack, cider brined pork loin, and prime rib aux poivre). A fine cheese trolley is of course provided. If you have any room for desert, Jacques apple tart is superb (though every sweet we tried was amazing). For us “Jacques” was the best of all, and we were able to return later for a second night! Red Ginger, an Asian fusion restaurant is the most popular of all the eating places with mouth-watering cuisine. Book well before your trip on-line to secure the times and date you want. The ambience is exotic – a racy red and black colour scheme. The menu offers something-for-everyone. To start, there is sushi and tuna tataki, spring rolls and calamari. There are courses for soup (Tom Kha Gai it turns out is very popular), salad (spicy duck and watermelon and Thai beef), before moving on to the main course. The lobster pad Thai is a definite hit as are the seven spices crusted lamb rack and the miso-glazed sea bass. Toscana is Tuscan cuisine. The restaurant sits at the stern high up on deck 14 with wonderful views. Included are hot and cold antipasti, soup, pasta, risotto, salad and "secondi" (the Italian word for entrée). Particular specialties embrace lobster risotto, pan-seared sea bass with lemon and capers, and a decadent lasagne. The wine list focuses, naturally, on Italian bottles. One fun feature of Toscana is its olive oil menu (almost as detailed as the wine menu). Ask your waiter to help pair your bread of choice with the right olive oil. 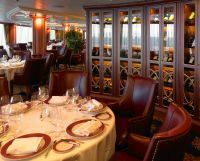 Polo Grill is the ship's steakhouse with classic fare that includes Oysters Rockefeller, whole Maine lobster, lobster bisque, Cobb Salad, and, of course, a wide variety of steaks and chops. Try the King's Cut 32-ounce prime rib (if you dare), New York strip, rib eye, filet mignon and porterhouse. Don’t be put off by the term “burger”. The Kobe variety is a Japanese masterpiece. The sweets are not bad either including home-made marshmallows, with caramel and chocolate sauces on offer. Waves Grill is on the open deck and serves a good variety of what is termed ‘fast food’ but is of an upper echelon with plenty of salad items available too. The best beef burgers at sea by a long way and a huge variety of ice cream. Cruise prices for Oceania can be very competitive especially in what the travel trade call the ‘shoulder season’. What you will find expensive is the cost of alcoholic drinks plus an 18% service charge which makes them prohibitive. True Oceania offers certain receptions for both new cruisers and regulars, plus ‘happy hours’ on a regular basis, but once you are into (the excellent) wines the bill can go up appreciably. Off ship tours are also expensive and for the most part I suggest using a local contractor (only use ABTA bonded, and insured). They can be found on line. We in fact departed the ship at Rome (Civitavecchia) with most passengers staying on until Monte Carlo. Transfer was a taxi for €105 by Rome Cab Transfer, ready at the quayside, and very pleasant. The (optional) service charge is US$15 per person per day.